Mnangagwa took over the presidency of Zanu PF and Zimbabwe in the background of a November 2017 coup that toppled long serving president Robert Mugabe. The people of Zimbabwe and the international community celebrated the demise of Mugabe because of the tyranny that he was. Mugabe was a self proclaimed Hitler of Africa and Mugabe was happy for people to label him exactly that. And he behaved exactly like that both at home and internationally. The people of Zimbabwe had suffered enough through Mugabe's regime so they had every reason to celebrate because they never thought it could get any worse than it was during Mugabe's era. The people of Zimbabwe including opposition members welcomed Mnangagwa to take over and finish Mugabe's term of office. What the people of Zimbabwe didn't realise was that they were celebrating coming from a hot plate stove into a boiling frying pan. They celebrated a new breed of dictators. When Mnangagwa took over, he sold the term "new dispensation" and "Zimbabwe is open for business" mantra. But in actual fact there was nothing new in the dispensation. It was a case of continuation of the old regime. Only faces had changed but the system remained. The open for business mantra was just a term used to sell the country but there is nothing open in Zimbabwe, it is still the same old way of doing things. Mugabeism is still very much intact only new enforcers and drivers. The bus is still the same, Zanu Pf regime, just the driver is new Mnangagwa. He is not even new because it's the assistant driver who has just taken over the reigns of power. The assistant, Mnangagwa in my opinion is proving to be a worse driver than Mugabe. Mnangagwa is actually a very dangerous driver because he indicates right and turn left. What he says in public and what he does in the dead of the night are two parallel lines that will never meet. He preaches peace and democracy to the world when he is busy murdering his own people. Mugabe was smarter than Mnangagwa because Mugabe was intelligent but Emmerson is so dull and he just doesn't have a clue on how to take Zimbabwe out of its comatose state both politically and economically. 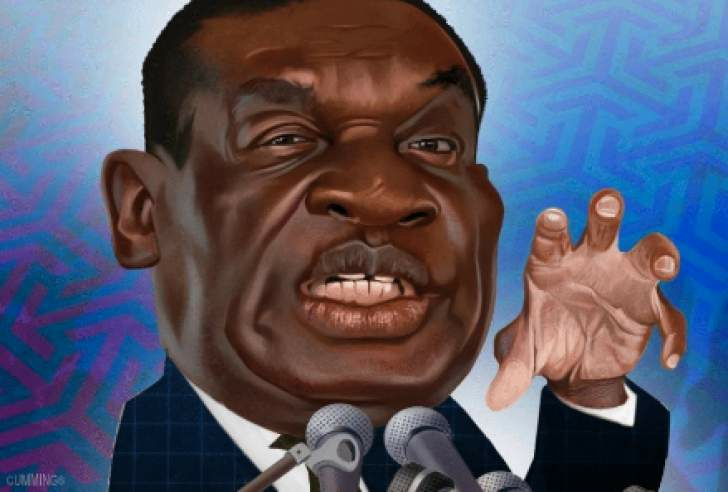 Emmerson Mnangagwa called an election in July 2018, which he knew he wasn't going to win. He knew that he was going to force himself into office by rigging the election as they had been used to doing during Mugabe era. He called and allowed international observers to come and observe the elections. He blatantly stole the election under the watchful eye of international observer. He thought they would be so daft not to see his shenanigans he was going to use to steal the election. The EU and Commonwealth observers missions both concluded that the election results were neither credible, transparent and the playing field wasn't fair. Results were unverifiable and untraceable which means that the results just came from somewhere. Not verifiable, in short the international community said ZEC cooked the results in favour of Mnangagwa. Mnangagwa was given the presidency by ZEC and the constitutional court. The people of Zimbabwe clearly rejected Mnangagwa on the ballot box. But Mnangagwa being the enforcer as he has always been, he became president by hook and crook. He forced himself onto the people. As soon as he was endorsed by the constitutional court, he started stamping his authority and suppressing any form of dissent by brutal force by using the army instead of the police to enforce law and order. Mnangagwa is clearly using his tactics he got from Mugabe during Gukurahundi, Murambatsvina and the 2008 operation wavhotera papi. Mnangagwa is clearly proving to be the brains behind all these murderous operations that happened during Mugabe's role because of the way he is using the army to crackdown any form of dissent by Zimbabwean citizens. He is clearly leading a military government. So far he has willingly killed 23 innocent civilians using the army to carry out duties which could've been carried out by the police force. At this rate of murdering people, only God knows how many people he would have killed by the end of his five year term. He has proven to be bloodthirsty of innocent civilians. Mnangagwa has also shown his love for luxury and inability to stop corruption within government. None of the criminals targeted that we were made to believe surrounded Mugabe is in prison. He is only targeting G40 members who are his enemies. He has also targeted opposition MDC members including elected Members of Parliament. He has so far charged more people with treason including women than were charged during Mugabe's era. He has done absolutely nothing to weed out corruption within government departments. His love for luxury is also seen by the number of foreign trips he has embarked on since he has taken over the presidency. The trips so far hasn't been of any economic benefit to the country. No investment deals he has reportedly signed has yielded any positive results. Infact, so far to close to fifty companies have closed in Zimbabwe since Mnangagwa became president. So is Zimbabwe open for business or it is actually closing for business. In all these foreign trips he has been on, Mnangagwa through Mary Chiwenga company has hired very expensive and very luxurious private jets to take him and his entourage on useless globetrotting. Mugabe was even better because he was chattering the national airline and if he was paying I think he was Air Zimbabwe's number one customer. But at least Mugabe wasn't wasting the scarce foreign currency that Zimbabwe desperately needs. With the way things are right now in Zimbabwe both socially and economically, most Zimbabweans are in a worse position than they were during Mugabe's era. Cost of living has escalated and prices are going up daily and looks like there is no-one in charge. It therefore looks like Zimbabweans were fooled into celebrating a worse devil than the one they were used to for the past thirty seven years. The scenes of November 2017 therefore reminds me of the Shona saying which says "Kupururidzira N'anga neinobata mai" and the English saying which says "it's better to keep the devil you know than the one you don't". Mnangagwa is actually not as soft as wool which is what he wants the world to believe. Mnangagwa is actually a crocodile as his nickname (Garwe) says, that is very thirsty for human blood. Mnangagwa is actually taken Zimbabwe into the road to nowhere.